This Asparagus Cacio e Pepe channels the famous pasta – with Cheese and Pepper. 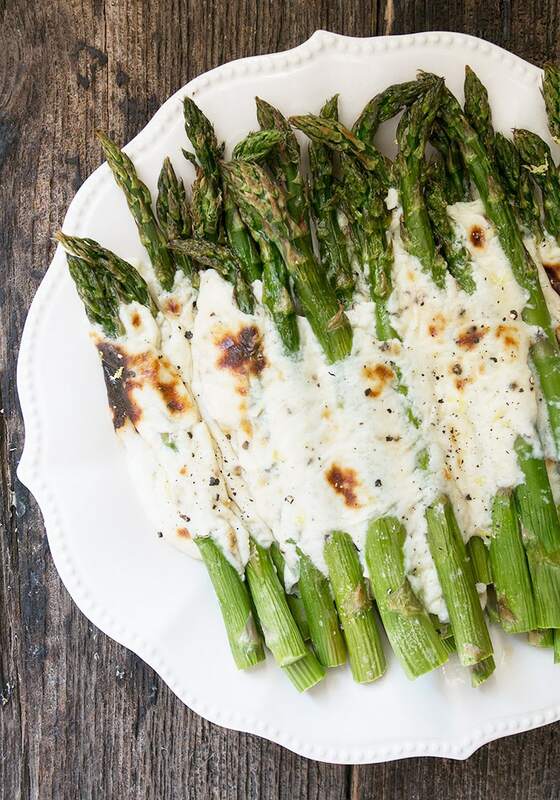 Easy and delicious way to enjoy Spring asparagus! 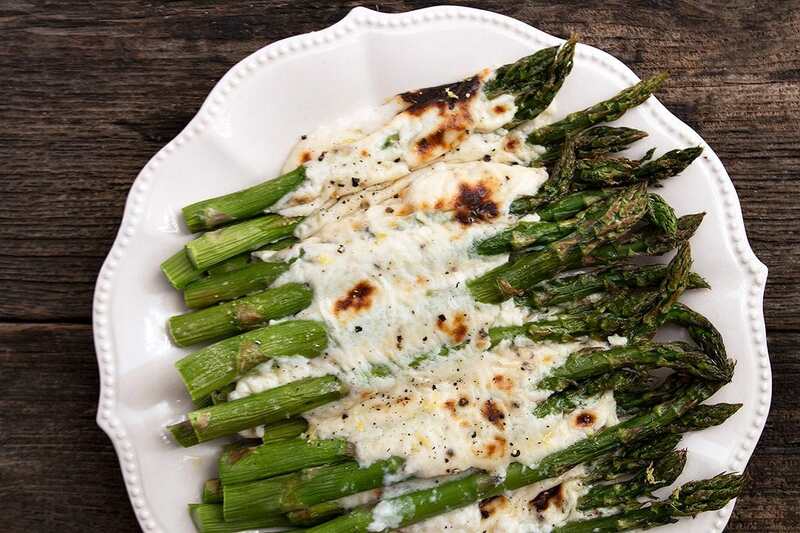 If you are a fan of the famous cheese and pepper pasta version, you will love this Asparagus Cacio e Pepe. It’s both easy and delicious and a great way to enjoy Spring asparagus. 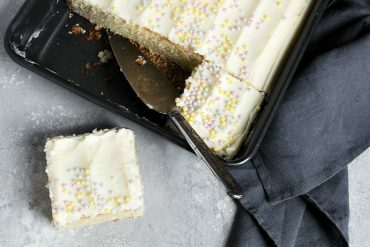 I thought I would share this one last recipe that might be useful for anyone looking for an addition to their Easter meal. The sauce cooks up quickly on the stove-top as a simple white sauce, filled with Parmesan and freshly ground pepper. Pour over your asparagus on a baking sheet and roast for 15 minutes. Pop under the broiler to brown it up if you like and enjoy. You can make the sauce ahead if you like, and refrigerate. Since the sauce with thicken in the fridge, you’ll want to re-warm the sauce a bit before using, so that it pours nicely overtop of the asparagus. You could do this in the microwave, if you like. Bringing the classic cheese and pepper pasta sauce to your Spring asparagus. In a medium saucepan, melt butter over medium heat. Stir in flour and cook, stirring constantly, for 1 minute. 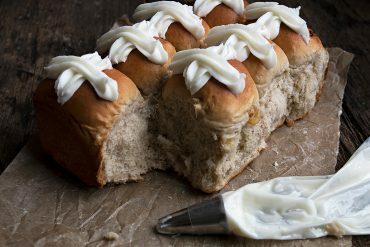 Whisk in milk. 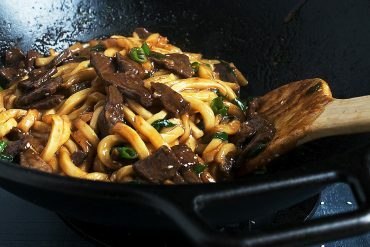 Bring to a simmer and cook for 5 minutes.Remove from heat and stir in Parmesan, pepper and salt. 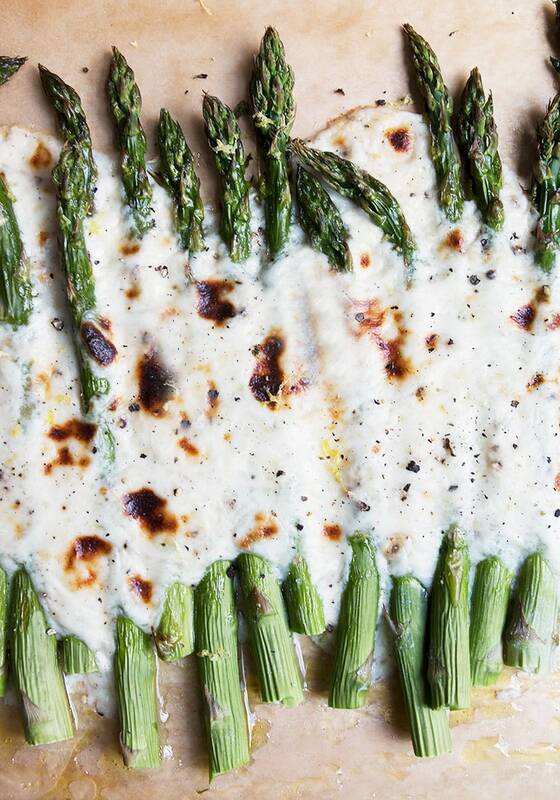 Lay asparagus in a single layer on a parchment-lined baking sheet. 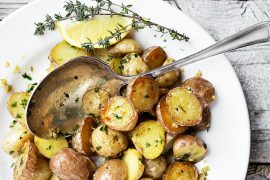 Brush with olive oil and season with some salt and pepper. Pour sauce over the middle of the spears, from side to side, leaving the top and bottom of the asparagus spears exposed. Roast in preheated oven for about 15 minutes, or until asparagus is just tender. Place pan under the broiler for a minute or so to brown up the cheeses sauce. 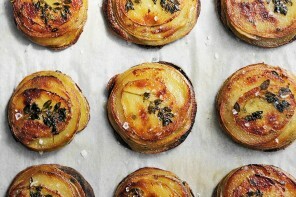 Remove from oven and let stand a few minutes. Using a spatula, carefully transfer asparagus (with sauce) to a serving plate. 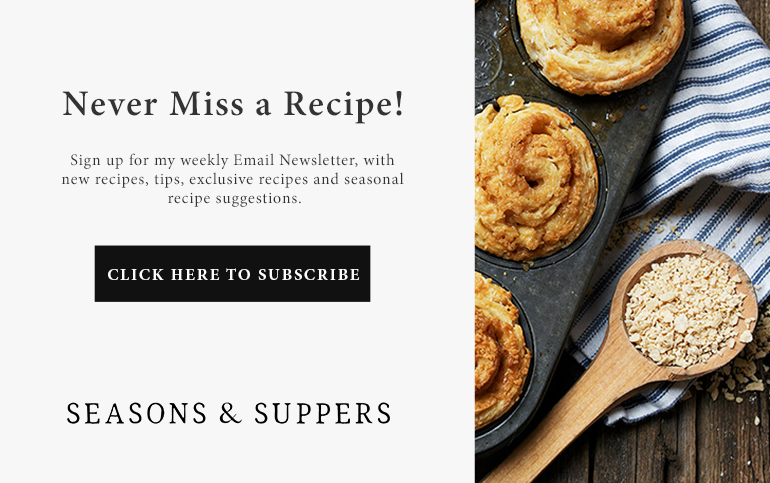 Join Seasons and Suppers on Instagram! Another pasta sauce inspired treatment for your Spring asparagus. 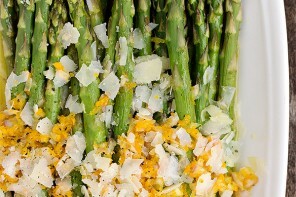 Warm asparagus with an orange butter sauce. 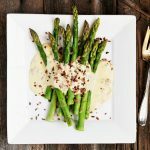 Roasted asparagus with a creamy cheddar sauce. 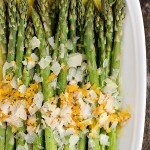 I love spring asparagus dishes Jennifer! I’ll be adding this one to my list. It looks soooo good! 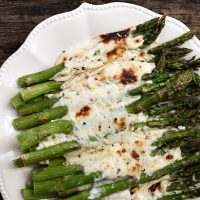 Such a delicious way to enjoy spring asparagus! Love the twist on a classic!! That sounds dreamy, Jennifer. Bit of bread for swiping up that sauce and some vino and I’m one happy lady! Happy weekend! Thanks Dawn and you, too! This is AMAZING!! 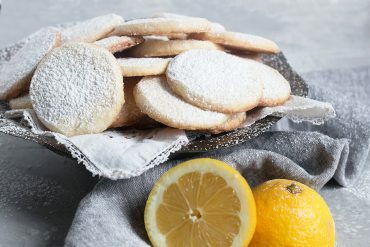 So simple but so delicious! I agree with Cheyanne – such a terrific combo! I could east asparagus every single day :) Perfect spring deliciousness! This is such a genius mash up, Jennifer!!! 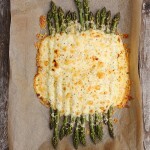 I absolutely adore asparagus, and that melty cheese has me drooling!! 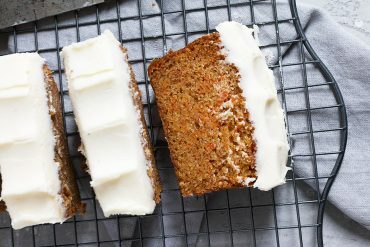 So much yum!! Cheers!